Lollipop Jones and Pecan Sandie were standing in their office staring at the map on the wall. “I can’t believe, nothing.” Lollipop complained. “No it doesn’t.” Lollipop agreed. The office door opened. Stepping away from the map, the detectives looked at the hopeful client. Standing in front of them was a slender woman in a blue dress with a fur wrap over her shoulders. Her delicate hands tightly clutched a small purse in front of her. “Are you the detectives?” She asked, looking at the duo. It wasn’t the first time anyone had inquired. Lollipop Jones was a lithe figure wearing a trench coat and hat, a white sucker stick perpetually jutting from her mouth. Pecan Sandie was a hulking mountain of muscle. Sharing a knowing glance, the detectives nodded to the woman. “Please have a seat.” Lollipop said, sitting down behind her desk. Pecan leaned against the wall, as the woman sat down in the offered chair. “I need help.” The woman started. “No, nothing like that.” Heidi said, dismissing the assumption. “It’s my husband, Peter.” She said, taking a handkerchief from her purse. “What’s going on with Peter?” Lollipop asked. “He never came home.” Pecan stated. Heidi dropped a shredded, stained rag on the desk. Lollipop poked at it with a pen. “A rag?” Pecan asked, confused. Staring at the stains, the detectives made out the faint hint of crimson underneath the mud. The shirt had been bloodied. “This is really a matter for the police.” Lollipop stated. “I tried that, they said they can’t help me.” The woman responded, crying harder. 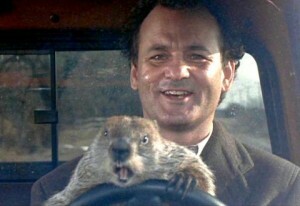 “Really?” Heidi asked, her voice filled with hope, sunshine, and rainbows (you know all that bright sunny day stuff). Pecan and Lollipop nodded. “Thank you.” Heidi exclaimed. The woman dropped a small bag with tufts of fur and a white chunk of plaster onto the desk. “I almost forgot, I found these with the shirt.” She explained. “Thanks.” Pecan said, lifting the bag from the table to examine the contents. “We’ll be in touch as soon as we know something Mrs. Stubbe.” Lollipop stated, standing up, and showing Heidi out of the office. Shutting the door behind the woman and turning around, Jones saw Pecan Sandie removed some of the tufts from the bag and sniff it. He stopped and contemplated it for a moment and then licked the fur. “You are worse than a kid. You don’t have to put everything in your mouth.” She scalded her partner. “Werewolf.” Pecan said in response. “This fur is from a werewolf.” Pecan explained. I don’t know what’s going on, but this picture is awesome. 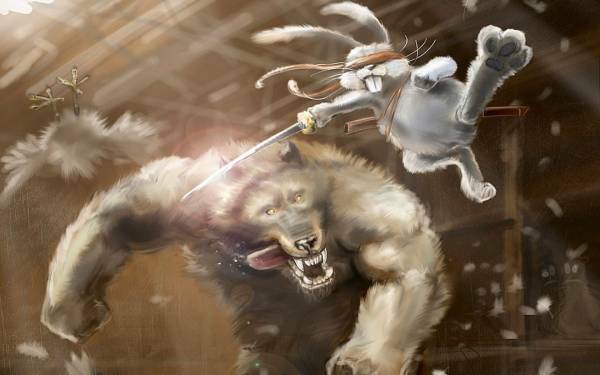 It has a werewolf and some sort of rabbit samurai. And those chickens in the back are freaked out! “How can you tell?” Jones asked. She had undergone a lot of training when she was raised by the Fighting Sisters of the Closed Fist, a sect of warrior nuns, but nothing that would allow her to discern werewolf fur from taste. “It’s wolf fur with a hint of shampoo.” Sandie explained. Taking the plaster hunk, she flipped it over. Embedded in the substance was a cast of a footprint. It was clearly a combination of a man’s footprint mixed that of a wolf. “Plus, last night was the first full moon.” Pecan stated. “Maybe her husband is the werewolf.” Pecan offered. A smile broke on Pecan’s chiseled face. Lollipop rolled her eyes and headed out the door. The animal control office also served as the pound for the area. They were greeted by the city dog catcher Milton Talbot, who was sitting behind a small desk. “You youngsters looking to take home a puppy?” He asked, squinting through the incredibly thick lenses at the duo. “No.” Lollipop stated, it was common knowledge that Milton was practically blind. “You have any weird dog sightings?” Pecan asked. The older man just chuckled. “Oh yeah.” He said, opening a file cabinet drawer beside him. “May we?” Lollipop asked, reaching for the file. The civil servant started whistling an oddly familiar tune as he left. The detectives watched the man climb into the truck with cages built into the back. With Milton pulling away, they started to leaf through the reports. A lot of citizens had been reporting a weird upright “dog thing.” Checking the dates on the earliest reports, Pecan looked at his partner. “They started four months ago.” He confirmed. “On the full moon?” Lollipop asked. Pecan shrugged and grabbed the calendar from off the wall. Fortunately for them, it showed the moon’s phases on the different nights of the month. After a quick moment, Pecan confirmed that the dates coincided with the full moon. “Great, first Dracula, and now a werewolf.” Lollipop lamented. “I have a book for this.” Pecan stated. “It says here that werewolves are adept at blending in and hiding their existence. The only way to stop one is with a silver bullet.” Pecan explained. “My axe blade is a fifth silver.” Pecan added. Lollipop glared at the behemoth behind his book. “Fine.” She stated, feeling foolish for thinking it might work. The city had several prominent dog parks. Arriving at the first park, Pecan and Lollipop walked along the fence, looking for a clue. “What are we looking for?” Lollipop asked. Choosing not to respond to the obvious statement, Lollipop continued moving along the perimeter. “Wait.” Pecan said. Turning, Lollipop saw the big man kneel down next to a bush. “He was here.” Sandie informed his partner. “What did you find?” Lollipop asked. “Half eaten box of dog biscuits.” Pecan said. “We are at a dog park, of course someone brought dog biscuits.” Lollipop said, trying to explain to her friend why this may not be a clue. “But dogs don’t normally eat them like this.” Pecan responded. Lifting up the box, Jones could see that the top of it had been bitten off and most of the contents eaten. “We set a trap.” Pecan stated, standing up. Standing outside of the small suburban home, Lollipop and Pecan waited. “Are you sure about this?” Lollipop asked, her finger hovering above the doorbell. Ringing the doorbell, the duo waited as they heard sounds of movement inside the house. Heidi opened the door. Her blue dress had been traded in for a pink jumpsuit. “Did you find Peter?” She asked. “Not yet.” Pecan informed the woman. “Do you and your husband spend a lot of time together around the middle of the month?” Lollipop asked. “No, he normally has to take a business trip for about a week.” Heidi explained, clearly confused. “But not this month?” Jones asked. “Do you know your husband is a werewolf?” Pecan asked, bluntly. The man had a direct approach that seemed to work for him. Heidi looked at the large man with a strange look. “Is he serious?” She asked Lollipop. “Yes, he is.” Jones confirmed. “Yeah but three to four nights out of the month, he’s not a person.” Lollipop stated. “Do you happen to have any on hand?” Pecan asked. “Lord yes, he always keeps tons of them around.” Heidi said, closing the door. She returned a moment later, carrying two boxes of the treats. “Same brand as in the park.” Lollipop confirmed. “We need to keep these.” Pecan stated. “We’re setting a trap for Peter.” Lollipop explained. “Okay. You do me a favor when you see him, tell him that I don’t care if he’s a weredog or whatever, just as long as he’s house broken.” Heidi said, smiling. Lollipop gave a strained smile to the woman. Pecan just walked off carrying the dog treats. Following her partner, off the manicured lawn, Lollipop and Pecan went over their plan again. “So he’s in the woods.” Lollipop stated. Pecan nodded, as the detectives headed towards the forested nature trail where Peter Stubbe’s shirt had been found. Standing in the darkened woods with the moon about to rise, Lollipop stared around the pathway again. Piled in the center of the trail were the contents of two boxes of dog biscuits. “Are we sure this will work?” She asked Pecan. Unfortunately, it had terrible road rage. Lollipop Jones stared at the mountain of muscle beside her. She knew her partner’s obsession with the iconic actor was incredibly fervent, so she decided not to question his knowledge. “How long do you think it’ll take for the big hairy menace to arrive?” Lollipop asked. As the moon rose into the sky, a strangely human sounding howl erupted in the forest. “Not long.” Pecan answered. The duo listened as twigs snapped and brushes rustled headed in a line for their position. Bursting from the trees, a wolfman stepped into the trail. He snarled at the detectives but turned towards the pile of treats nearby. Glancing back at the detectives, the mythical beast knelt at the food and started to shovel large handfuls of the treats into it mouth. The razor sharp teeth made quick work of the baked goodies. “He’s almost done.” Pecan commented, reaching back to his partner. The wolfman’s ears popped up and his tongue lolled out the side of his mouth. An excited whine escaped from its throat. “Go get it.” The hulking detective said, tossing the ball down the trail. Racing off on all fours, the beast grabbed the ball in its jaws and turned to rush back. It was halfway back to the mismatched detectives, when it stopped. Shaking its head, it started to growl. “What’s wrong?” Lollipop asked. “Everyone knows that.” Lollipop snapped, hurling the remaining two tennis balls at the werewolf. Jones’ throws were as accurate as a Roger Federer serve, if Roger Federer played in some weird tennis association with monsters. The first ball slammed into the wolfman’s snout and the other popped off of his throat. Wrapping its hands around its snout, the werewolf yipped and tried to shake off the ball attack. Flicking the battle axe to its full length, Pecan prepared to face the monster. Lollipop stood behind her partner, waiting. “I don’t know why I can’t take this one.” She stated annoyed. 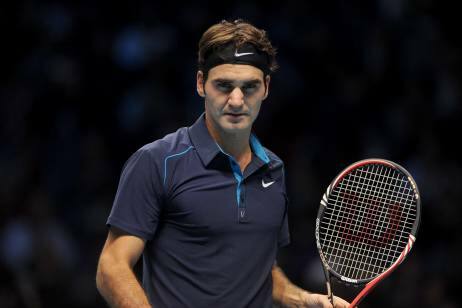 Is Roger Federer supposed to be scary? If not please explains this picture. “Book, yeah I know you’ve been quite the literary sort lately.” Lollipop interrupted, finishing the statement. Shaking off the annoyance in its nose, the furry creature stood up and howled. Bearing its fangs, the creature rushed the awaiting axe wielding man. Pecan bellowed a war cry and prepared to take a swing. The wolfman stumbled mid rush and turned around. A red tipped dart was lodged firmly in the creature’s rear. “That’ll keep the fellow from being so agitated.” Milton Talbot said, stepping from the woods, a rifle in his hands. Lollipop and Pecan followed the dog catcher out of the trail to where the large white animal control vehicle was waiting. The other occupants were yipping and baying from their enclosures. Before the duo could act, Milton opened a large cage in the back, and used the pole to guide the werewolf into the container. Once inside the other animals in the surrounding cages immediately silenced themselves. “You kids have a nice night.” Milton said climbing into the truck and driving off. “What do we tell Mrs. Stubbes?” Pecan asked. Milton parked the truck in the animal control’s lot. He started unloading the smaller cages and taking their occupants to the pens in the rear of the facility. As he came out to get the big one, he saw a pale man in a fancy suit, kneeling down, talking to the animal. “I’d be careful fella.” Milton cautioned. “He will not harm me.” The man said. “Sorry sir, but rules is rules.” Milton responded. “Sorry mister, I can make out general shapes, but I can’t make out a lot of details.” Milton explained. “Fine, I’ll fill out the form.” The man stated exasperated. “What’s your name?” Milton asked. “Huh.” Milton said, turning around. Dracula hit Milton on the back of the head, sending the dog catcher falling to the ground, out cold. “Civil servants, bah! Give me a hundred Van Helsings instead.” The vampire lamented. Unlocking the cage, Dracula helped the wolfman from his confines. “You’ve really got to be careful Peter. This close to our gathering, you cannot be caught.” Dracula chided his fellow monster. From the surrounding trees, a man in a blue mask watched, silently observing these creatures of the night. A red cape fluttering from his shoulders.